Closer In or Farther Out? It’s no secret that home prices in better-located Southern California markets (closer to the coast, jobs, and good schools) have held up better than prices in inferior locations (those farther inland with longer commutes and not necessarily great schools). But if you are a home builder, you know the more outlying markets have more land at substantially lower prices than do the more desirable closer-in markets. So what’s the better strategy on land: try to find “safer” but scarce and expensive land in closer-in A or B locations or reach out into some of the C, D, or even F markets, where land is more plentiful and cheaper but where lower home prices might squeeze margins? To try to answer that question, look at the upside potential on home prices. Have the prime or closer-in markets already achieved more of their upside potential in the most recent up cycle, therefore leaving them less “room to run”? Are the less desirable or farther-out markets poised for more of a rebound in prices the next few years, possibly making them the better play? Or do the farther-out markets simply have insufficient demand now? Has a fundamental shift occurred, meaning those outlying areas will not come back this cycle? Housing prices in prime coastal Southern California submarkets have returned to prior peaks. It took eight years, but prices in the best-located submarkets in the three coastal Southern California counties (Los Angeles, Orange, and San Diego) have finally climbed back to highs last reached in the mid-2000s. 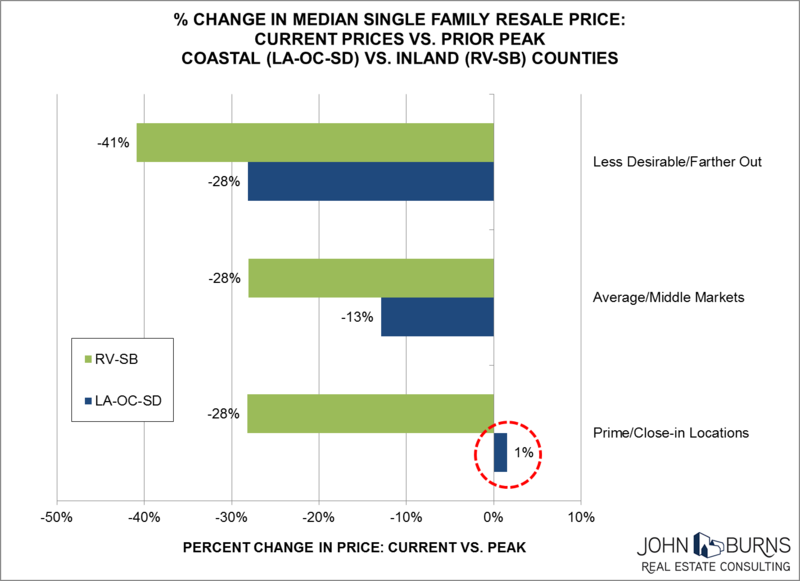 Single-family resale prices in the prime areas in the three coastal counties now exceed prior highs by 1%. “Average” coastal submarkets are 13% below prior highs, and less desirable / farther-out coastal locations remain 28% below past highs. The Inland Empire (Riverside and San Bernardino counties) is nowhere near prior highs. Prices for homes in the most desirable and average portions of the Inland Empire stand at an average of about 28% below the prior peak, and the more outlying areas are still 41% below past highs. Is the Inland Empire poised for strong price appreciation as commuters see the tremendous value? 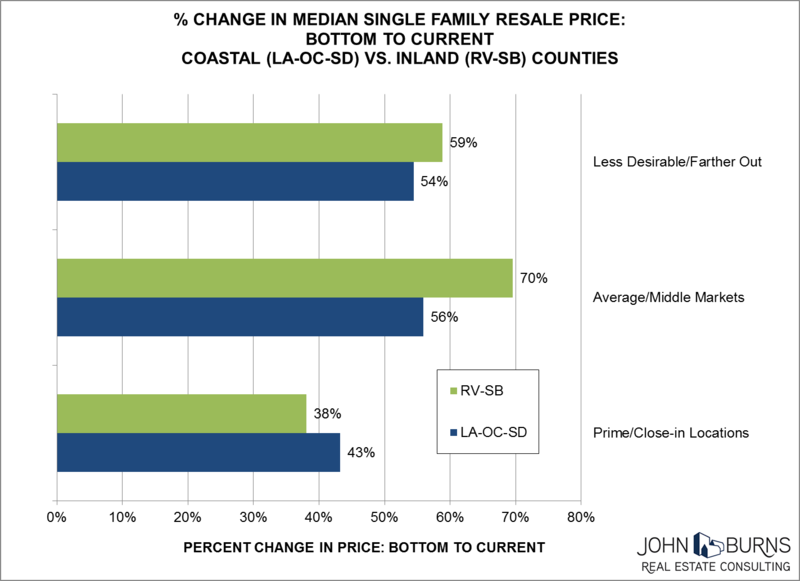 At the peak of the market, median prices in prime submarket locations in the Inland Empire stood at just 31% below the median prices in prime coastal markets, but today, prices in prime submarkets in the Inland Empire are 51% below prices in prime coastal markets. 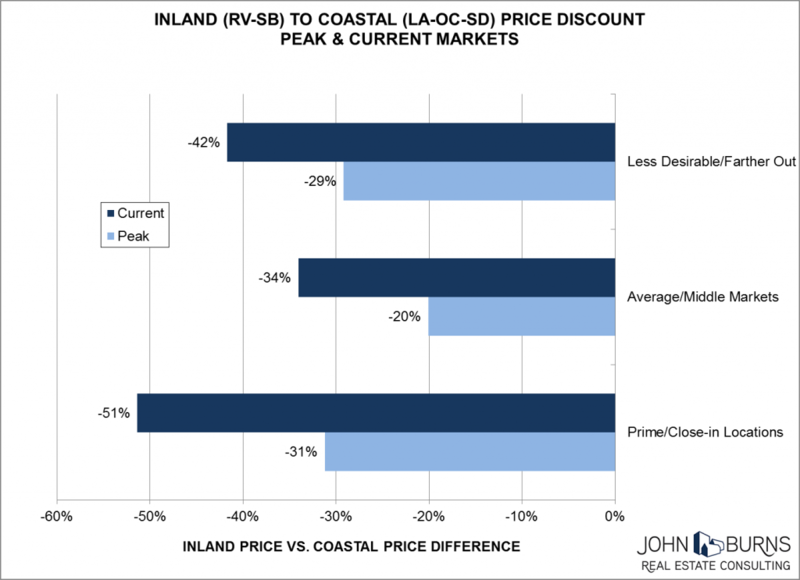 Likewise, the price differential between inland and coastal average and less desirable markets remains substantially wider than at the peak of the market, suggesting that inland market prices have more room to run than coastal markets. The outlying areas have historically had more downside risk, but today they appear to have more upside potential, too. During the downturn of the late 2000s and early 2010s, prices fell further across all submarket areas in the Inland Empire (-48% to -63%) than in the coastal counties (-29% to -53%). In the most recent up cycle, prices have increased faster in average and less desirable submarkets in the Inland Empire than in the coastal counties. (The Inland Empire price increases represent smaller dollar amounts since they start at much lower prices.) 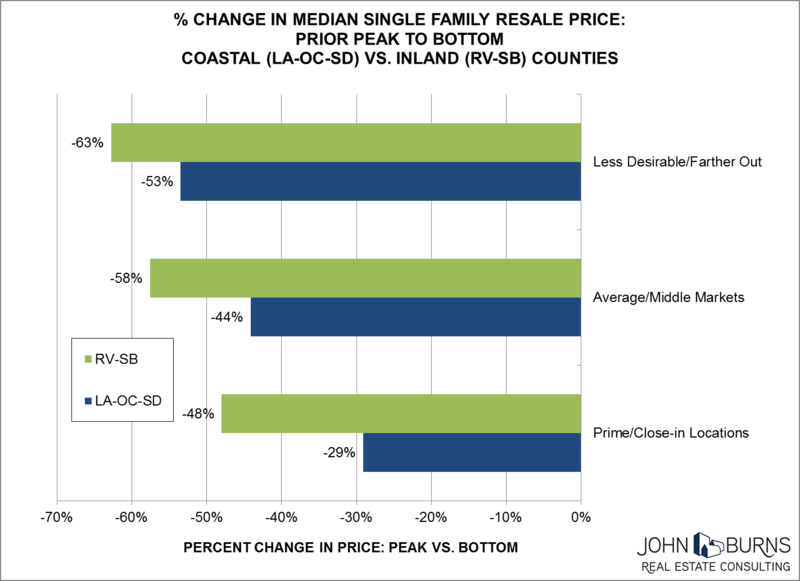 However, prices in prime coastal markets have risen faster (43%) than in prime inland markets (38%). For all they tell, these data do not answer the question of whether there has been a permanent shift in where new home demand will be: higher-priced, closer-in markets or more affordable, farther-out markets. (Prices can appreciate in both locations, of course.) New home project sales rates can help answer this question. In the Inland Empire, projects in the farther-out markets are averaging 3.5 sales per project per month YTD in 2015, while projects in average locations are averaging 3.2 per month, and projects in prime locations are averaging 3.1 per month. In comparison, county-wide project-by-project monthly sales rates YTD in the coastal markets are: Los Angeles, 2.9; Orange County, 3.2; and San Diego, 2.7. Projects in the Inland Empire are achieving comparable to faster sales rates (on average) than coastal projects, and the farther-out parts of the Inland Empire have the fastest sales rates. As each submarket has its own dynamics, we cannot conclude that all outlying areas have a better than usual risk/reward trade-off right now. But the Inland Empire clearly has plenty of new home demand and good upside price potential relative to the coastal markets. Lower home prices mean you may not make as much per house, but if you want volume and price appreciation, you should look at the farther-out locations. The home values are there in the prime coastal markets, but high home prices are affecting sales rates. The “farther-out” submarkets in the coastal counties are worth a look as well. 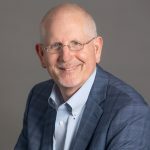 For more information on Southern California market trends, please contact Pete Reeb, Principal, at preeb@realestateconsulting.com or (858) 281-7216.